Special Containment Procedures: All specimens of SCP-1147 are to be stored in separate planters in a 10m x 30m x 5m greenhouse located above ground on the premises of Sector 28. 3 liters of water should be added to each planter every 7 days. Any instances of SCP-1147-1 produced by the specimens should be stored in the opaque container next to each planter. Personnel working in greenhouse are to be screened upon exit to prevent accidental dispersal of SCP-1147-1. Following test SCP-1147-DC all handling of SCP-1147-1 must be done with approved tools. Testing the safety and edibility of any specimen of SCP-1147-2 is restricted to D-Class personnel. After 48 hours of observation specimens may be cleared for general consumption. All tests must be approved by Dr. Laurel. Description: SCP-1147 is an unclassified species of plum tree whose seeds, designated SCP-1147-1, can be planted in practically any substance. The resulting plant will adopt physical attributes from the utilized substance. SCP-1147 has proven capable of growing in solids, loose material, and liquids via hydroponics. SCP-1147 produces fruit, designated SCP-1147-2. The original specimen of SCP-1147 was discovered growing from the steel base of a lamp post in ████ ██████, Georgia, where it was believed to be an art installation by the local population. Result: Normal plum tree closely matching similar species. Seeds retain anomalous properties. Substance: 20cm cube of galvanized steel. 5cm hole drilled into top, seed placed within, plugged with steel shavings. Result: Trunk is high quality steel with a superior tensile strength. 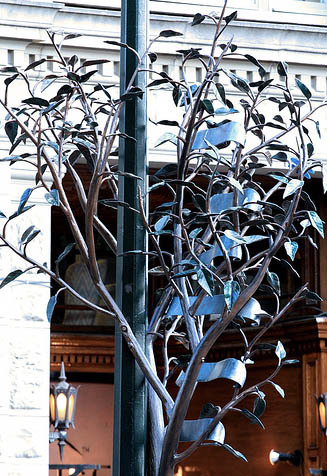 Leaves and flowers are thin, rigid zinc sheets and give off no scent. Fruit: Inedible. D-182 cracked tooth in attempt. Subsequent taste tests denied for specimens that can't be cut with a knife. Substance: Sand collected from ocean beach. Result: Trunk rough, brittle, and pale. Crumbles easily to touch into individual grains of sand. Leaves and flowers are translucent and colorless. Scent resembles ocean breeze. Structure collapses when subjected to simulated rain. Fruit: Inedible. Falls apart in the hand. Substance: Seed pressed into recently forged 20cm glass sphere as it cooled. Result: Trunk is clear, flawless, faceted glass. Roots visible within sphere. Leaves act as prisms, casting a spectrum of light onto surfaces. Flowers are light pink glass, with a subtle scent. 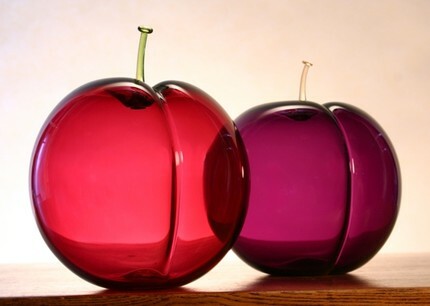 Fruit: Hollow, colored glass. Inedible. Substance: Planter filled with poured concrete. Seed pressed 5cm under surface. Result: Trunk matches color, texture, and strength of concrete. Leaves are pliable. When soaked in water and applied to a surface they harden into a firm shell. Flowers share similar properties and have a chalky scent. Substance: Charcoal ground into rough powder. Result: Trunk dry and cracked, resembling a tree after a forest fire. Leaves black and crumble easily. Flowers smell like burnt wood. Recommend storing away from other specimens in case of accidental combustion. Fruit: Withered and smoky flavored. Produces a small quantity of liquid which is easily ignited. Substance: Shredded white printer paper mixed with water into pulp. Result: Trunk composed of layered sheets of white paper that can be peeled away individually. Leaves are yellow with light blue veins. Flowers multicolored with the texture of tissue paper. Scent resembles a new book. Fruit: Edible, but largely flavorless. D-431 received minor cuts on lips/tongue. Substance: Processed, compressed cotton stored in fabric sack. Result: Bark is a brown felt with a cotton core, giving in to pressure. Bark does not heal naturally, but can be stitched closed with no negative effects. Leaves are green felt with stitched veins. Flowers are pink cotton with the scent of freshly washed laundry. Fruit: Resembles a plush plum. Edible, but just barely. Substance: 20cm cube of stacked lumber. 5cm hole drilled into top, seed placed within, plugged with wooden dowel. Result: Trunk resembles normal plum tree, but drier. Branches easily cracked. Leaves and flowers dry, colorless, with the scent of sawdust. Fruit: Inedible. Surface smooth and polished with a visible grain. Substance: $2,183 US in mixed bills, shredded and mixed with water to form pulp. Result: Similar structure to SCP-1147-PA, but trunk is a pale green in color. Leaves bear a random mix of symbols and images commonly found on currency, but do not resemble complete and passable bills. Flowers have the scent of fresh dollar bills. Fruit: A paper skin filled with dark ink. Sample of ink had a mild plum flavor. Result: Trunk is smooth, transparent and cool to the touch, resembling quartz. Leaves thin, membranous and waterproof. Flowers emit unscented mist. Fruit: A thin but durable skin containing approximately 100ml of potable water with a slight plum flavor. Seed floating within. Result: Bark is black, giving, and perpetually greasy. Leaves share similar properties. Flowers produce a combustible vapor. Specimen to be isolated in a separate enclosure. Fruit: A thin but durable skin containing approximately 100ml of a refined petroleum similar to diesel fuel. Seed floating within. Result: Trunk is white and stronger than normal wood. Leaves and flowers are soft with a slightly sour scent. Fruit: Creamy and solid, with a skin and flavor reminiscent of brie cheese. Serves well with white wine. Result: Specimen grew gnarled and erratic, with a mottled bark pattern. Leaves sag. Flowers produce a thick foam. Fruit: A taut skin containing approximately 100ml of 6.5% abv stout beer. Seed floating within. Result: Bark consists of green plastic. When peeled off, circuits present on interior. Leaves resemble solar cells in construction, and are capable of collecting energy even after detached from specimen. Flowers utilize fiber optics to produce light displays. Fruit: Inedible. Can be adapted into solid state storage device. Analysis of contained data ongoing. Substance: ████-brand plastic building blocks. Result: Entire tree is constructed of individual, multi-colored blocks, including leaves and flowers. Specimen can be broken apart and rebuilt into different configurations and will resume growth with no negative effects. Fruit: Each fruit is constructed exclusively out of violet bricks, with a seed cradled at the center. Substance: 20cm cube of wax. Seed pressed 5cm into wax as it cooled. Result: Tree easily mistaken for a natural plant at a distance, but subtle sheen and stiffness of leaves noticeable upon closer inspection. Vulnerable to deformation at higher temperatures. Fruit: Edible, with a soft plum flavor, but no nutritional value. With wick inserted, fruit will burn for approximately 12 hours. Note: All specimens in this category raised in isolated underground testing chambers at Sector ██. Access restricted to Security Level 3. Substance: 30 liters cow's blood. Result: Bark is flaky, with a dark color reminiscent of dried blood. Leaves are thin and translucent, featuring a web of red veins. Flowers are a dark crimson and emit a red mist once a day. Specimens should be tended and watered only by D-Class wearing environmental suits until the nature of Researcher Parker's illness can be determined. Fruit: Resembles a regular plum with a nearly black skin and dark red juices. D-968 and D-2401 vomited and convulsed within 1 hour of ingesting an entire sample. Further testing suspended. Substance: Complete cow skeleton, ground into powder. Result: Trunk is smooth and white, with a core of marrow. Produces no leaves or flowers. Result: Bark resembles cow flesh, complete with thin layer of mottled hair, covering striated muscle. Produces hair in place of leaves. Flowers bud as fleshy sacs before ripening into fruit. Scent is rotten and disorienting. Fruit: Raw ingestion produced symptoms reminiscent of food poisoning. Cooked fruit more edible but taste described as "gross" and "wrong." Substance: Seed implanted under the forearm skin of restrained D-Class subject. Result: Growth resembled an additional limb, with roots entangled in the veins, nerves and bones of the arm. D-1052 reported no ill effects and responded to stimulus given to SCP-1147-DC. After surgical removal both specimen and D-1052 expired on the operating table, autopsy pending. Fruit: [REDACTED] All samples of SCP-1147-DC-1 and SCP-1147-DC-2 destroyed. Substance: Complete human brain from D-1398. Result: Bark is pale and membranous, with dark veins visible beneath the surface. Specimen responds to harmful stimulus by shifting away at a rate of 1cm/min. Leaves laced with a dense web of veins and nerves. Flowers resemble primitive sensory organs, sensitivity tests ongoing. Fruit: Upon attempted removal of fruit [DATA EXPUNGED]. Agents ██████████ and █████ from MTF Theta-4 responded and specimen now under control and observation. Requesting all available records pertaining to D-1398.